You can optimise the sub-volumes of the inline and crossline sections as well as the horizontal slices (time or depth) of a 3D volume. An optimised volume uses extra disk space to boost performance. A volume loaded with default settings (16-bit main volume, all three 8-bit optimised volumes) is about 150% the size of a 32-bit input SEG-Y. If you use the SEG-Y Loader to import new SEG-Y data, it will include optimised volumes by default (see Output and Writing Options (3D SEG-Y)). 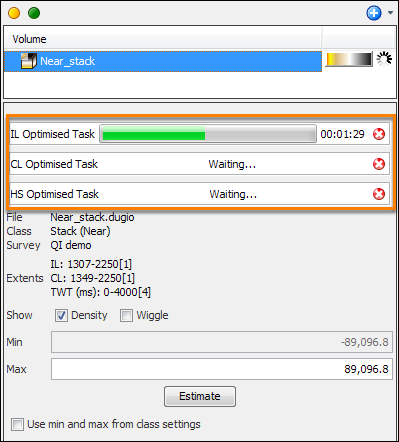 However, if the optimised volumes are not loaded to Insight or you have volumes loaded from older versions of the SEG-Y Loader, you can still optimise 3D volumes within Insight. Some volumes require large numbers of calculations to display – usually complicated process volumes (see Processes Overview) or volumes with phase-rotation applied (see Manual Mistie Corrections). To boost the performance of these volumes, consider exporting the volume (see Exporting a Copy). 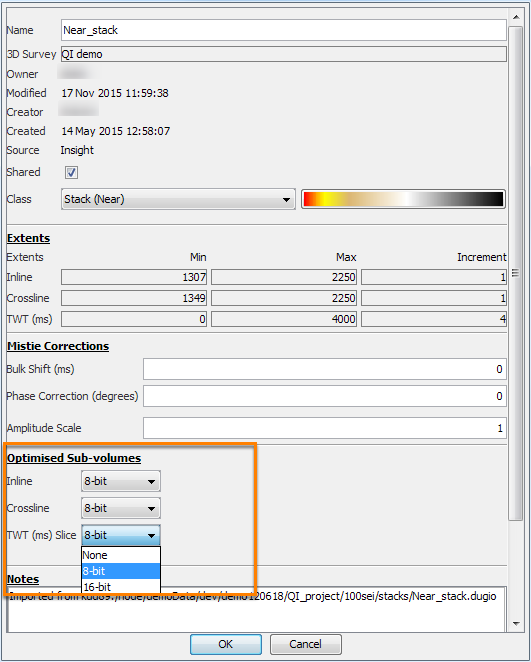 Select a volume which you want to create optimised slices. Double-click the selected volume or right-click the volume and click Configure 'Volume'. The Configure Volume window will be displayed. Go to the Sub-volumes section. You can select 8- or 16-bit optimised volumes for inline, crossline and/or time/depth slice. The operation to create optimised sub-volumes will continue in the background. See image below. When the operation is completed, the sub-volumes will show as 8-/16-bit in the Configure Volume window. Using optimised volumes massively boosts the speed of viewing your data. In most cases, 8-bit is the best choice. When processing or exporting data, the original volume is used.